If you’re over not creating the spiritual and financial wealth you desire, then you are in the right place! My sacred service is to remind you that you are so deserving to live prosperous and free just being yourself. You have a sacred mission on this Earth and you are so deserving to be financially rewarded for that! The truth is that you have SO MUCH RICHES just WAITING for you to claim, and I am so excited to support you in activating them. Just a little about me, I am an online BLISSness (business) strategist, Reiki Master, Sound Healer and Prosperity Priestess. I am called to teach healers, soulpreneurs and lightworkers how to ignite their revenue and build an online business of freedom and pleasure. My work has been featured on ABC news, the Passionate and Profitable Podcast, the Spiritual Boss Babes Podcast, The Real Her, and the Heart Beat. I’m also an author in the international best selling book Mind Body Transformations. During my 10-year healing career, I’ve worked in marketing, sales for some top coaches, taught international retreats in Hawaii and Canada, travelled to almost 20 countries, consulted Yoga Festivals, top social media influencers and more. And I haven’t even hit my 30s yet! All that experience has led me here: to a place where I can provide IMMENSE value and love to you! So now… let me get to know YOU! To build momentum at lightning speed, I’d love to know more about your business, your vision, and what truly turns you ON! I only have limited spaces available for calls. The women I select to talk to are the ones I believe that my team and I can help reach their goals. 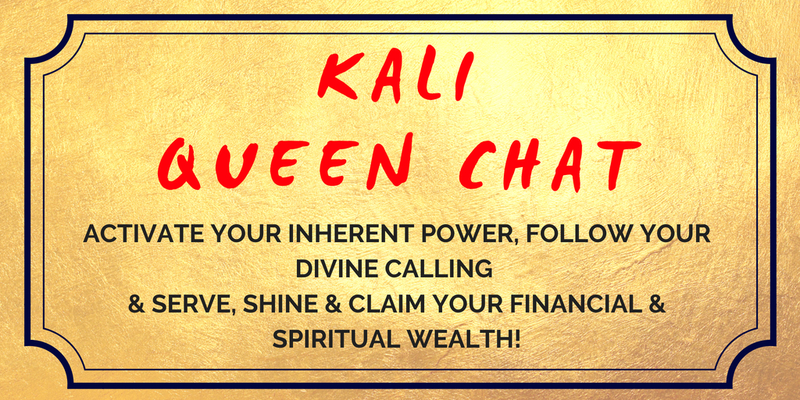 To give you an amazing Kali Queen Chat, the more information we have in this application the better! Of course your personal information is STRICTLY CONFIDENTIAL. You can rest in knowing this! Let’s get started by selecting a time that works for us both. Your time zone should be automatically detected, but if it doesn’t come up simply change it in the drop down box below. Thank you so much. I can’t wait to ‘meet’ you! !